The six crewmembers aboard the International Space Station will enjoy some down time over the holidays. While many people on Earth will spend the last hours of 2010bouncing from party to party, New Year's Eve should be a relatively subduedaffair for the astronauts aboard the International Space Station. The six spaceflyers ? three Russians, two Americans and anItalian ? will have today (Dec. 31) off work, NASA officials said. Saturday andSunday will be light as well, with just some routine housekeeping choresplanned. 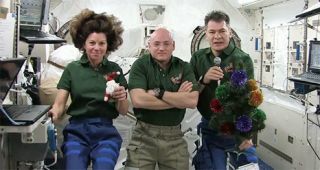 During this time, the astronauts will get a chance to talk to theirfamilies back home, and recharge their batteries in preparation fora busy 2011. The crewmembers will undoubtedly spend a fair bit of thedown time gazing at Earth from the station's Cupola module, which is studdedwith windows. "Most nights, I would say, after work we gothere," NASA astronaut Cady Coleman said in a video interview withreporters on Thursday (Dec. 30). "Lookingdown at Earth is simply amazing, and I'm not sure I will ever, ever gettired of it." Coleman, who arrived at thespace station on Dec. 17, said she also plans to devote some time topracticing her flute, which she has largely neglected up to this point. "It's just so busy, just learning how to work up hereand making sure that you're getting all your work done. I haven't been able tobreak my flute out yet," Coleman said. "I'm hoping to do that thisweekend." Today's holiday is the second in quick succession for thecrewmembers, whoalso got Christmas Day off. The international group of spaceflyerscelebrated Christmas with a "family dinner" and a few presents,astronauts said. "The Russians actually gave us as a gift some littlechocolates, so we had plenty of things to celebrate," Italian astronautPaolo Nespoli, who also reached the station on Dec. 17, said. Coming up next week, half of the crew willcelebrate another Christmas holiday. The Russian Orthodox Church celebratesChristmas according to the Julian calendar, marking the event on Jan. 7 ratherthan Dec. 25. So, the three cosmonauts aboard the station will have anotheroff-duty day then. But Coleman, Nespoli and American Scott Kelly ? commander ofthe current crew ? won't get two Christmas holidays. Instead, they'll beworking on Jan. 7, NASA spokeswoman Nicole Cloutier-Lemasters, of Johnson SpaceCenter in Houston, told SPACE.com. To commemorate the New Year, NASA released a free 2011calendar featuring the International Space Station, which can be downloaded onthe agency's website.